Whistle Pig’s mission is to create truly Farm-to-Bottle Vermont Rye Whiskey. That means the grain, the wood used for barrels, and the water all originate from the Whistle Pig Farm. They also produce honey, maple syrup, grow vegetables, and raise heritage breeds of pigs, goats, and sheep. Even the pewter on some of the bottle stoppers is mined on the estate. The Farmstock Rye, Crop 001 is a blend of 1-year, 5-year, and 12-year-old whiskeys. The nose offers vanilla, caramel, toffee, and mint, while the palate shows more spicy notes of cinnamon and baking spice, alongside citrus peel and stone fruit. Enjoy this rye whiskey from a fiercely independent Vermont distillery! Whistle Pig Whiskey started in 2007, after Raj P. Bhakta purchased the 500-acre farm in Shoreham, Vermont. 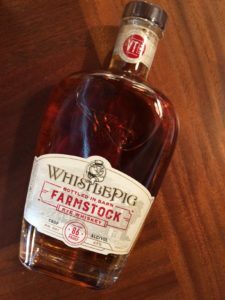 He teamed up with Master Distiller Dave Pickerell (of Maker’s Mark) and hatched a plan to transform Whistle Pig into the first estate-made single malt whiskey. By 2015, they were doing everything from growing the grain, distilling, barrel aging, to bottling all on the farm. Their vision is to resurrect American Rye Whiskey, and they’re off to a great start.